- Lightly etched into the surface of this ring, the words "forever love", framed by a pair of hearts, deliver a message of romance and devotion. Stainless steel ring is available in sizes 5-10, whole sizes only. Choose Size... Size 5 - Only 1 left! Size 6 - Sorry, Sold Out! Size 7 - Sorry, Sold Out! Size 8 - Sorry, Sold Out! Size 9 - Sorry, Sold Out! Size 10 - Sorry, Sold Out! Please choose the Size. 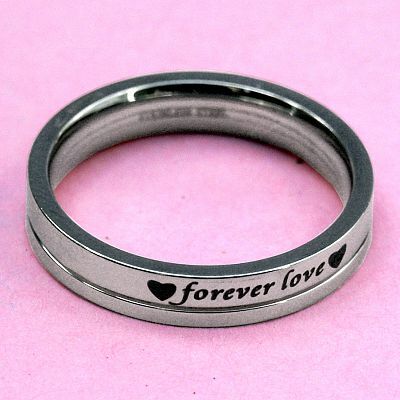 Do you have any other questions about our "Forever Love" Steel Ring?